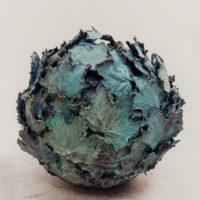 Ball of Leaves, patinated cast bronze, 36 x 36 x 36. 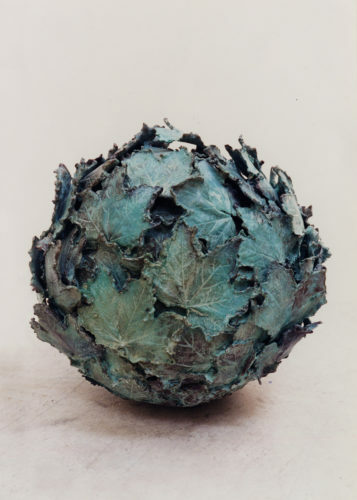 In 1995 Ball of Leaves was awarded the Environmental Sculpture Commission for the Corporate Headquarters of Salomon, Inc., at the now former 7 World Trade Center, New York, NY. 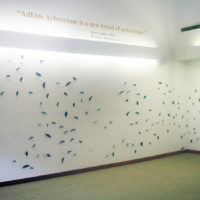 It was my first public art commission. 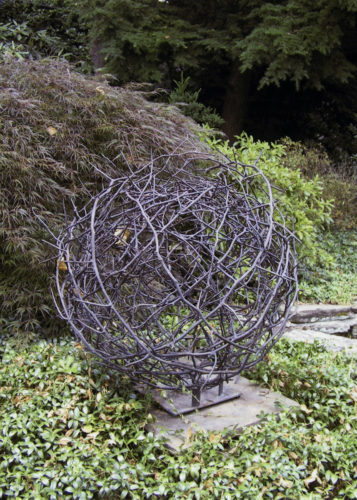 It is published in 100 Artists of the Mid-Atlantic, E. Ashley Rooney, Schiffer Publishing, 2011. .
Ball of Thorns, patinated cast bronze, 41 x 41 x 41. Private Commission, Philadelphia, PA. In the Wind, patinated cast bronze, 96 x 360 x 1.5 (overall dimensions of 2 walls). 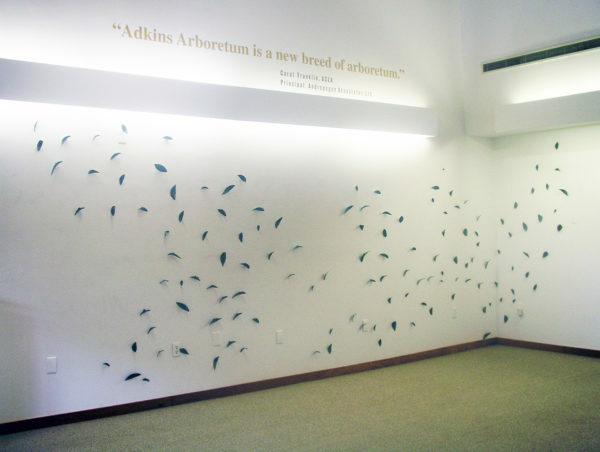 Site-specific installation for the Adkins Arboretum, Ridgely, MD. 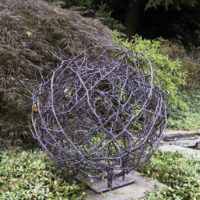 I work thematically and predominantly in unique bronze castings ranging in scale from gallery works to corporate, public and site-specific commissions. A new voice spoke to me over 25 years ago with my move from New York to Bucks County, Pennsylvania. It was the land and the River. It spoke a language I had never known, but spoke a secret language to my heart. The contemplation of the expressive figure gave way to the perception and experience of life in a glorious landscape and a hand-touch away from the River. It said this is home. Throughout every season this landscape of rolling hills, lush woods, multi-hued broad pastures and the slowly flowing Delaware River is breathtaking. Touch the River that carved through the landscape, and you are once joined to its opposite shore. Plunge into the silence of the woods and you are filled with enchantment, the canopy a cathedral. The woods are a sanctuary, a shelter. Its branches are arms, embracing us; its crown of leaves enveloping like hands. Here we bear witness to the natural cycle of renewal and rest. 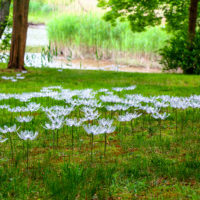 Landscapes and waterscapes, houses and abodes provide places where we can rest and dream. Working directly from nature I explore a synthesis of abstraction and realism. 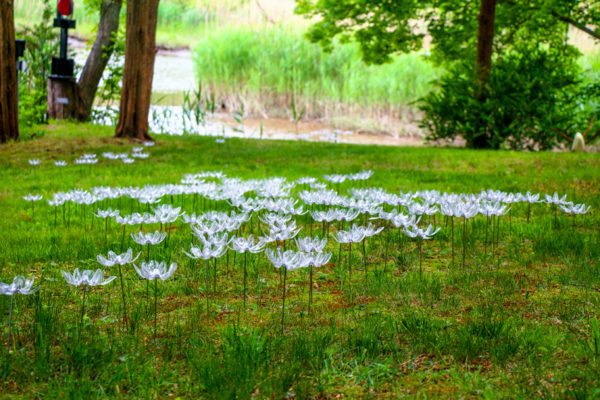 Sculpture brings the primacy of touch into our world of computer and television screens. Southeast Asian archaeology was studied at Vassar College and the School of Oriental and African Studies, London, England. Studio training was in New York at the Art Students League and the New York Studio School. I have had ten solo exhibitions, am included in over 30 corporate and private collections and completed 29 site-specific, corporate and private commissions, the first in 1995 for Salomon Headquarters, 7 World Trade Center, New York, NY. Recent commissions include Park Towne Place: Museum District Residences, Philadelphia, PA; and, the seven Sustainability Award commissions for the Hotel Association of New York City. My work was selected for Schiffer Publishing’s 100 Artists of the Mid-Atlantic and the internationally focused Green Art: Trees, Leaves and Roots.